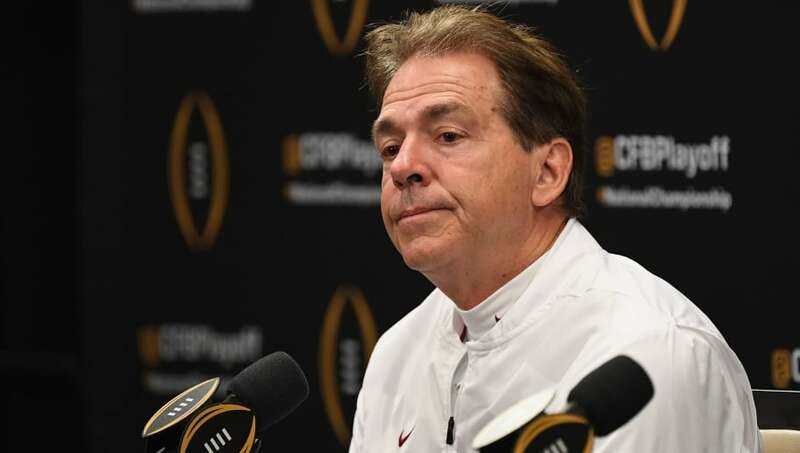 Alabama Crimson Tide football coach ​​Nick Saban came out a few days ago and made some questionable comments regarding the choices college players make in regards to leaving college early for the NFL Draft. Now, he's already walking them back and trying to pivot the narrative. ​​In case you missed it, Saban made several comments the other day that were pretty ridiculous. He talked about how certain players -- ​for one, Jaguars DB Ronnie Harrison, though not precisely by name -- made poor choices by leaving school a year early for the ​NFL Draft, and how he tends to disagree with these decisions a lot of the time. He suggested that Harrison, who was drafted in the third round of the 2018 draft, could have been a first-rounder in this year's draft if he had decided to stick around for his senior year. It's just hard to believe that Saban's comments are coming from a genuine place, however, as he clearly benefits any time a player decides to stay another year to play for his team-- and Harrison had an extenuating family circumstance that behooved him to hit the professional ranks as soon as he could. The Alabama Crimson Tide have become the ​dominant force in college football over the past decade, and consistently recruit and develop highly touted NFL draft prospects, so Saban is definitely familiar with the whole draft process. Although he may be knowledgeable about it, he certainly has a bias that goes with it considering his position in Tuscaloosa. Sorry, Coach Saban, but I'm just not buying that you actually DO support players' decisions mere days after saying you rather often don't.